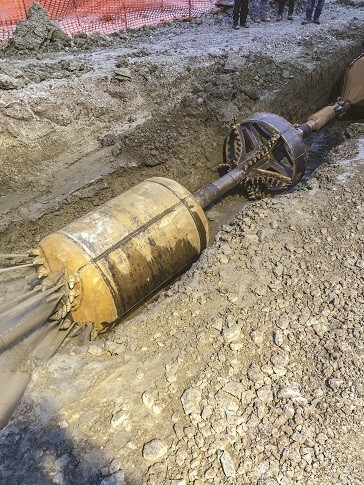 Joe Phillips, StraightLineHDD, Marc St.-Onge, HDDPLUS, Inc., and Tyler Gordon, Marathon Drilling Company, Ltd.
Extensive knowledge of local geology and tooling was instrumental in matching soil conditions with the reamers for the project. That’s exactly how Tyler Gordon approached a recent job outside the community of Orleans, Ontario. Gordon, a 16-year HDD veteran with Greely, Ontario-based Marathon Drilling Company, Ltd., tapped the expertise of Marc St.-Onge of HDD Plus, Inc.
Privately-held Marathon Drilling received a contract from the City of Ottawa to install 600 metres (2,000 feet) of high-density polyethylene pipe (HDPE) in Orleans. The 107-cm (42-inch) final product was part of an 8-kilometre (5-mile) secondary water feeder system intended to meet water service demands of a growing sub-division. After reviewing the project, Gordon observed that the bore contained sticky clay, typical of the area. The path of the bore was straight-forward, with uneventful steering and elevation changes. The job site was tightly nestled between a commercial complex parking lot and a highway. Maintaining easement and dealing with soil conditions in this area were not new challenges for Gordon. As with any HDD job, this one contained a couple of issues that had to be addressed. The first was environmental. Contained within the 600-metre bore path were three crossings, including Rockcliff Parkway Road crossing two creeks. One of the creek crossings was an environmental concern to Ottawa city planners. “The Green’s Creek crossing required extra attention,” explained Gordon. “This particular creek is a tributary feeding the Ottawa River, so we had to come up with a bore plan to eliminate the possibility of drilling fluid intrusion caused by frack-out into Green’s Creek.” Following an environmental study, the bore path was specified to place the bore at a depth of at least 10 metres under the Green’s Creek bed. This depth was critical to prevent intrusion into the protected waterway. The second issue Gordon faced was the sheer size of the utility to be installed. “One of the biggest challenges in completing the bore was the size of the pipe. At 42-inches OD – combined with the clay soil – I knew we had to have large machines turning a series of large-diameter reamers,” recounts Gordon. Marathon Drilling committed two rigs for the job: a Ditch Witch JT8020 and a Vermeer D330x500. The JT8020 was tapped to perform the pilot hole and 16-inch pre-ream. The D330x500, equipped with 5.5-inch IF Full Hole drill pipe, was specified to supply the 2,884 litres per minute (762 gallons per minute) of mud that was to be used on the bore. A 3,785 litre per minute (1,000 gallon per minute) mud recycler was added to the mix to handle the large projected mud volumes. Having specified the necessary rigs, Gordon turned to the critical issue of tooling. For that, he reached out to Marc St.- Onge, owner of HDD Plus, Inc. Based in Les Cedres, Quebec. St.-Onge’s extensive knowledge of local geology and tooling was instrumental in matching soil conditions with the reamers for the job. “The soils along the bore path were not necessarily hard,” says St.-Onge, “but, it was clear from the very beginning it was going to be a challenge to flow cuttings out of the hole.” St.-Onge knew that keeping the cuttings flowing was key in stopping the reactive clay from swelling. Also, maintaining the easement on the bore would be difficult due to the need to make multiple reamer passes. From that point, the pair spent considerable time weighing reamer options. Early in the process, StraightLineHDD reamers emerged as a leading contender for the job. St.-Onge and Gordon were both familiar with StraightLine reamers. “I’ve had success using StraightLine reamers in the past and actually had a 16-inch StraightLine reamer sitting in the shop from another job,” said Gordon. As the list of reamer options narrowed, St.-Onge contacted StraightLineHDD’s technical sales specialist, Lorenzo Chapman, to validate their assumptions. According to St.-Onge, StraightLine had come through in the past when tooling was required for a specific job application. During the course of the discussions, all parties focused on the need to avoid frack-outs and fluid management. A consensus quickly emerged that an aggressive, open-bodied reamer design was needed to mix and shear the high volumes of drilling mud. Again, Gordon and St.-Onge tapped the expertise of StraightLineHDD to help solve the issue. “In my business, part of my job is to connect my clients to vendors that not only have the right products for the job, but are also willing to apply their expertise to the problem at hand,” says St.-Onge. After reviewing the details of the bore, the StraightLine team went to work. The company’s Reverse Radial Flow reamers were selected, in 24-, 36-, 48- and 54-inch diameters, to perform the initial reaming passes. To stabilize the cutters during the initial passes, 22-and 34-inch Maxi-Barrel reamers were specified to follow each Reverse Radial Flow. Finally, a 54-inch Reverse Radial Flow, followed by a 46-inch Maxi Barrel was selected to handle pipe installation. According to Gordon, the Reverse Radial Flow reamer’s aggressive cutters and large fluid ports – in both push- and pull-back – combined with its freeflowing, open-bodied design, provided the cutting and mixing performance required. Running the barrel reamers in tandem with the Reverse Radial Flows gave the Marathon crew the flexibility to deliver high volumes of drilling fluid, while providing vital wall stability. Over a five-week period, the Marathon crew conducted the progressive reaming process. Each pass was carefully pulled and pushed to ensure that the hole was being prepared for the next step. From Gordon’s perspective, even with the multiple reams and the heavy burden associated with the fluid management, the payback was a picture perfect pullback process and a project that ran about as smooth as any he’d been involved with. And while the residents of Orleans might never give it much thought when they turn on the water tap, the water that’s feeding this growing community came about because a manufacturer, supplier and a contractor “played” on the same team to achieve a common goal.